Anita West paints large scale paintings of the beach and the bush in a particularly Australian manner, the bright light reflecting everything around it and the colours dancing, giving the subject matter a mirage-like quality. In her seaside scenes, she hones in on the crowded sun lovers viewed through half closed eyelids. Born in Brisbane in 1965, the middle child between two brothers, Anita was raised in Gladstone and then Townsville. Both parents had a love of the bush and her work is a dichotomy of fragmented images drawn from experiences of both. “Tom Roberts painting The Shearing Shed invokes in me romantic notions of the land that I hold dear,” she says. 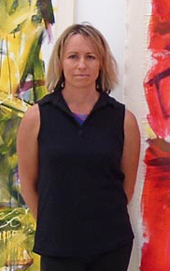 Anita studied for her Diploma of Art in the 1980s in Townsville under mentors Anneke Silver and Bob Preston. In 1986 she completed a Graduate Diploma in Education and although teaching art initially, while travelling in the USA she left teaching to explore her art, experimenting with styles, line, colour and medium. Her first exhibitions, although small, were well received and she has made a living from her art ever since. Anita is married to a scientist, has two young children and works from home. She coaches and plays soccer and every now and then rents a city studio for an “artist’s weekend”. Her mantra is “art is about life, life isn't about art.” Her influences include Fred Williams, Robert Juniper, John Olsen, Elizabeth Cummings and William Robinson. 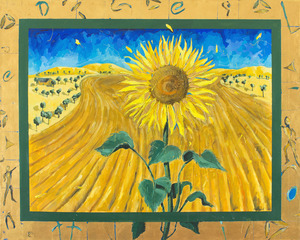 Anita has produced three major exhibitions, completed many commissions, and been widely published in leading magazines. Working mostly with transparent acrylic under bases employing oil as the final layer, her paintings have a happy edge that enhances modern spaces with energy and a lilt strongly connected to the Australian psyche.